We got our first snowfall this week. As with most first snowfalls in the Midwest it was all melted by the afternoon. That first snowfall is an indicator that winter is really on its way. I have said before I love the changing of the seasons, so call me crazy, but I am looking forward to a lovely white blanket of snow covering the brown grass. 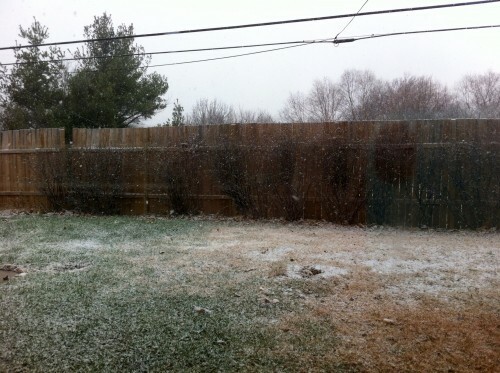 Little snow flurries in falling in our backyard. This soup is a perfect wintery comfort dish. I used carrots and celery that were leftover from my Thanksgiving relish tray in this soup and Rotisserie chicken. 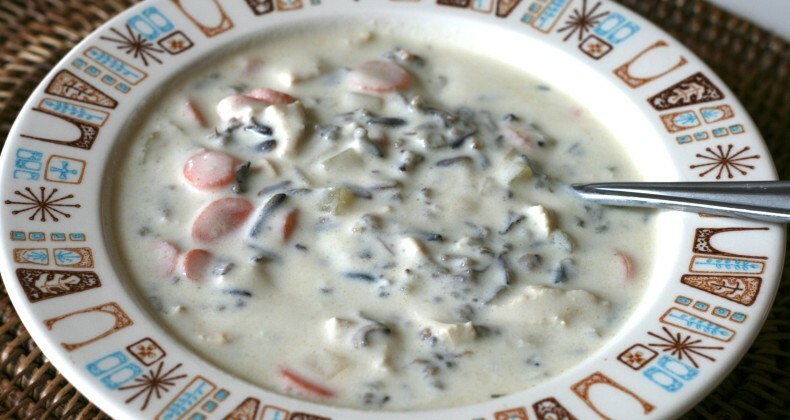 The hardest part of this soup was waiting for the wild rice to cook –40 minutes! You know how some food is better on the second day? Like lasagna? Well this soup falls into this category. 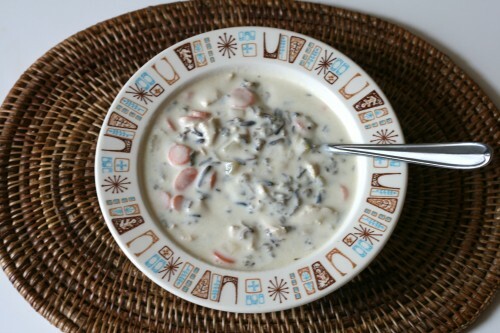 Sometimes soups with pasta or rice in them tend to absorb up all the broth while they sit in the fridge overnight. Well the wild rice did not do this. I’m not sure if that is because wild rice is coarser than white rice. Anyone have a hypothesis? This is a substantial soup that I would serve to dinner guests. Last year my mother-in-law Judi served soups for our Christmas Eve dinner. If she decides to do that again this year, I think I know what I’ll make 🙂 If you have a Panera Bread near you may have tried their creamy chicken soup –I’d say my soup could stand up with it their’s any day. Make this soup tonight and reheat it tomorrow for a cozy dinner. In a large pot sautÃ© oil, carrots, onion, celery, and garlic over medium heat for 5 minutes, until vegetables soften a bit. Add 7 cups of chicken stock to pot and thyme, turn up to high, and boil vegetables for 5 minutes. Turn down to medium low, stir in chopped chicken, and prepared wild rice. In separate smaller sauce pan melt butter over medium heat. Stir in flour and cook until roux turns a golden brown. Slowly stir in the reserved 1 cup of chicken broth. Let simmer until broth thickens. Slowly stir in the cream. Stir in the thickened broth/cream mixture to the soup. Simmer for 5-10 minutes. Season with salt and pepper to taste.